The Women in Ministry Initiative supports the creation of a gathering space on the third floor of the Princeton Theological Seminary Library, establishing an archive of materials requested from Princeton Seminary women in ministry around the world, publishing a book, and supporting future programs and projects. 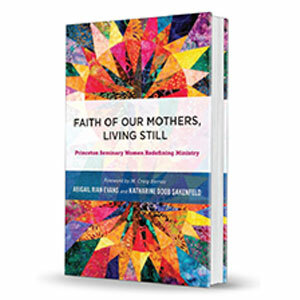 Abigail Rian Evans and Katharine Doob Sakenfeld, Faith of Our Mothers, Living Still: Princeton Seminary Women Redefining Ministry (Louisville: Westminster John Knox, 2017). Gardner and Sakenfeld, “In the Beginning Male and Female, Then She Came to Seminary: A History of Women at Princeton Theological Seminary,” Theology Today 69.3 (2012): 306-18. Additional audio recordings of past lectures, services, and events related to women in ministry are available in the Princeton Theological Seminary Media Archive (hosted on the library website) and on SoundCloud.